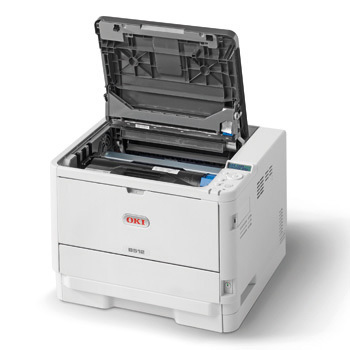 The B512dn black & white printer from OKI packs a lot of versatility, productivity and bottom-line savings into a compact frame. The B512dn Digital Monochrome printer from OKI will give you more choices, so you never have to settle for ordinary performance again. 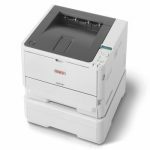 If you’re looking to improve the productivity and lower the operating costs of your business, the B512dn offers all of that and more. For starters, the B512dn delivers up to 47 ppm, with the first page printing in as little as 4.5 seconds.1 It produces black & white output that’s clear and crisp at up to 1200 x 1200 dpi resolution, using a two-piece consumables system for long-lasting performance and a low cost of operation. The B512dn features a fast 667 MHz processor, as well as 3 GB of memory2. It has a 630-sheet standard paper capacity (530-sheet main paper tray + 100-sheet multi-purpose tray) and can be outfitted with an optional 530-sheet 2nd paper tray, giving them a maximum capacity of 1,160 sheets—for longer uninterrupted productivity. Fit for any work environment – With its compact size, the B512dn fits just about any work space. It has USB 2.0 and 1 GB Ethernet interfaces standard, and a WiFi® option (802.11 a/b/g/n). The B512dn supports cloud/mobile solutions such as Google Cloud Print™, AirPrint™ for Apple iOS and OKI Mobile Print app for Android® devices. 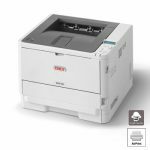 Cost-efficient LED printing – The B512dn employs LED printing technology pioneered by OKI over 20 years ago—and is still innovative today. OKI LED printheads have no moving parts, making them ultra-reliable. OKI printers are compact, environmentally friendly, energy efficient, and use significantly less raw materials in the manufacturing process. And they deliver HD (High Definition) printing for more accurate and striking documents. 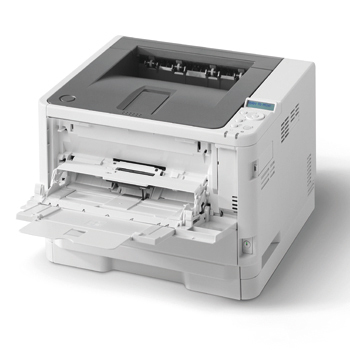 The B512dn comes with duplex (2-sided) printing standard, leading to fewer user interventions and savings on media costs. Its Deep Sleep mode— which reduces energy consumption to less than 1.5 watts—and Auto Power Off feature—which shuts off the printer after a long period of no activity—have earned the B512dn an ENERGY STAR® rating. 1Published performance results based on laboratory testing. Individual results may vary. 2512 MB RAM + 2.5 GB flash shared memory. 3Available in the U.S. and Canada only.